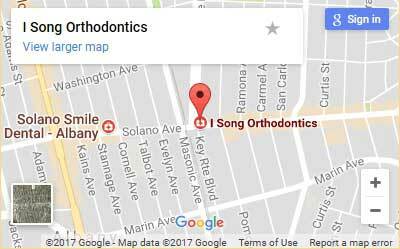 At I Song Orthodontics, we’re committed to providing quality orthodontic care to patients of all ages. We offer a variety of treatment options, including Invisalign and Invisalign Teen, so that you can find a solution that fits into your budget and your lifestyle. While it’s important to take care of your teeth all the time, it’s even more important when you have braces. There is a higher possibility for decay while your teeth are under braces because the wires, bands and brackets make it more difficult to reach all the spaces in between your teeth. Dr. Song has provided some helpful tips for keeping your smile healthy! For optimum results, use a toothbrush with soft bristles and brush your teeth in small, circular motions. Try to gently brush by the gum line to release food particles that may be stuck under there. Hold the brush at an angle and brush between the braces along with every surface of the teeth. Flossing is just as important as brushing because it cleans the areas around the teeth that a toothbrush can’t. Flossing will be more time consuming and difficult while you’re wearing braces but your healthy, beautiful smile will be worth it. Think of your braces as your second set of teeth. As long as they’re clean, your teeth will be clean! Also, be sure to continue seeing your general dentist throughout your orthodontic treatment. Even though braces seem sturdy and set in place, they are actually very fragile and need to be taken care of. Certain foods can break or damage your braces, leading to a longer treatment time. Foods that are sticky, sugary, or hard should be avoided as sticky foods get caught in between brackets and wires and hard foods can potentially break or damage the brackets or wires. We’ve provided a helpful list of foods to avoid. This is not a complete list, so use your best judgment and common sense when you’re faced with certain food! Take extra precaution when eating fruits with pits as you could accidently bite into the pit. This would include fruits like peaches and plums. Cut meat off of the bone to ensure you won’t accidently bite into the bone. Avoid chewing pencils, fingernails and ice. Do not bite into anything and then pull away with your teeth. This could pull on your braces leading to bending or breaking them. Keep in mind that the list above is not a complete list. Use common sense when it comes to eating certain foods. If you cannot cut it into smaller pieces, it’s probably not a good idea to eat it. It’s important to regularly check your braces for bent or loose wires and brackets. In the event of a loose/broken wire or bracket, call our office at (510) 528-2220 immediately to arrange an appointment for repair. Download this information to use as a quick reference guide. If a separator falls out, call our office and come in for an evaluation. It is not an emergency, so if it does happen on the weekend, it can wait until the following Monday. Do not play with the separators and keep your fingers out of your mouth. Avoid flossing where the separators are located. However, you can brush normally. Gum and other sticky foods can dislodge the separators so avoid them. If you experience any discomfort, take Tylenol or any other oral analgesics. The rate of growth of the patient. How often the headgear is worn. Taking care of your headgear is extremely important for the orthodontic process to go smoothly. Below are some helpful tips to help guide you along the way. Wear the headgear 12-14 hours a day or more. Be consistent and wear your headgear every night. Missing even one night means making up for lost time with several extra nights. This will extend overall treatment time. Use a “score card” to track the amount of time the headgear was worn so we can determine how effectively the treatment is working. Bring the score card and headgear to every orthodontic appointment. If the face bow comes off at night, try increasing the force by one hold on each side. Possible discomfort in the back teeth for 48-72 hours after placing the RPE. Awkwardness with swallowing and speech for several days after the RPE is placed. Gap development between upper front teeth. This is normal and temporary. Pressure for a short period of time after the RPE is activated each time. Insert the hex key into the activation screw at the 12 o’clock position or have the plastic handle pointing up toward your nose. If the patient is initiating the expansion, turn the key counter clockwise by pushing on the embossed target sign on the expansion handle. If a parent or another adult is initiating the expansion, turn the key clockwise instead. Follow your orthodontist’s instructions as to how many turns should be made each day. Avoid chewy or hard candy and do not chew ice. Do not play with the RPE with your tongue or fingers. A positioner is used after the braces are removed to help guide the teeth into their final placement. It looks similar to a mouth guard and is custom-made to fit your teeth. Most patients wear the positioner for a few months before switching to a retainer. Wearing Instructions: Wear the positioners for three days and three nights. Then, for the next few weeks, you can wear it for several hours during the day and then all night as you sleep. Exercise: Occasionally clamp your teeth into the positioner to help make the teeth move better. We will show you how to do this. Proper Care: Brush your positioner before putting it on and after you take it off. Rinse and dry it with a towel before placing back into the protective case. Always use the protective case to store it and never leave it where pets or younger siblings can get to it. Keep it away from heat because it can melt. Damaged or Lost Appliance: Contact us as soon as possible if you lose or damage the positioner. We may be able to repair it depending on the damage. There will be a replacement charge if the damage is too severe. Aligners are to be worn full time with the exception of cleaning teeth and eating, amounting to a minimum of 20-22 hours per day. When aligners are not in the mouth they are not working, so treatment is not progressing! If periods of time pass and aligners are not in the mouth, small increments of “relapse” can occur which will greatly affect treatment responses and time. You may drink cool water only with your aligners in, but stay away from hot and colored liquids to prevent warping and staining your aligners. Attachments are components of Invisalign treatment that are either facilitating difficult tooth movements or keeping the aligner stable. It is very important that the “bumps” or attachments on the teeth engage into the corresponding “bumps” in the Aligner. Each time you insert your aligners, use your “Chewie.” Bite the chewie multiple times along the full arch. Each time you place your aligner it is very important that you check to be sure the attachments are engaged. If it is not engaged, the attachment can possibly work against your treatment plan. If this happens, keep chewing on your chewie to help facilitate the fit (this can sometimes take minutes). Check attachments regularly and if one is chipped, broken or loose, notify your doctor promptly, so your treatment does not regress. Be sure all attachments are intact and not loose. Report any problems to our office promptly. Be sure that when you place the next/new aligner that the attachments engage. Change to the next set of Aligners every 2 weeks or as directed by Dr. Song. If the current aligner is still fitting tight (difficult to remove or place or causing soreness with wear), or if small clear edges appear between the aligner and the teeth in any area DO NOT change the aligner yet, wear it for one more week. If after the 3rd week of wear, any of the above are still present, call our office so we may inform Dr. Song. You can set an alarm reminder in your phone every 2 weeks or simply mark down in a calendar to stay on track. Clean your aligners at least once a day. Brush and floss your teeth after every meal or drink. After eating, if you can’t brush your teeth, rinse out vigorously with water before inserting your aligners. If you break or lose an aligner, call our office immediately. If an aligner gets lost and needs to be replaced there will be a replacement fee. Occasionally, an aligner may have a sharp edge, it may be shaven down with an emery board. Scanning or impressions may be necessary during or at the end of treatment. It is not an indication of something “wrong”, but simply Dr.Song’s way of making adjustments in the treatment. At the end of your first series of Aligners it may be necessary to wear another short series of Refinement Aligners before the plan is completed. Lack of cooperation/Lack of Aligner wear can result in additional treatment fees to complete your treatment.